WASHINGTON, D.C. -- In 2018, Gallup published nearly 100 global reports and articles on what people in more than 140 countries are thinking and feeling. 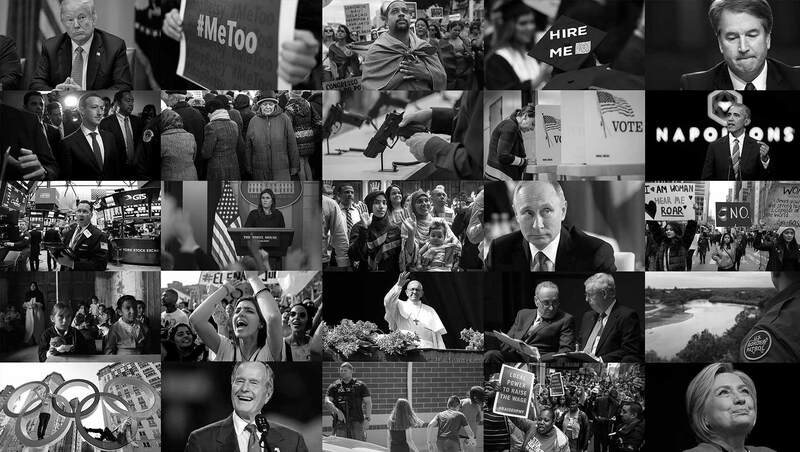 Through our World Poll, Gallup systematically tracks and reports on wellbeing, leadership approval ratings, confidence in national institutions, employment rates and other issues affecting people's daily lives and, ultimately, the choices they make. World's Approval of U.S. 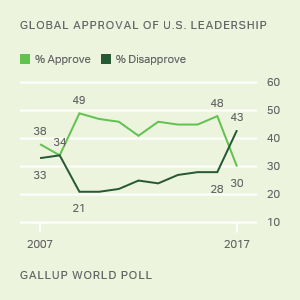 Leadership Drops to New Low: Germany replaced the U.S. as the top-rated global power in the world in 2017, as approval of U.S. leadership sank to a new low of 30% during the first year of Donald Trump's presidency. Gallup's report on the ratings of world leaders revealed U.S. alliances and partnerships at risk. Real Global Unemployment Is 33%, Not 6%: There's a problem with how the world defines and measures unemployment. About half of the people worldwide who are self-employed are really unemployed. These jobs aren't really jobs. Gallup investigated the real jobs situation in 128 countries and found out where the greatest gaps are between good and great jobs. World Took a Negative Turn in 2017: The world was more stressed, worried, sad and in pain in 2017 than at any point in the past decade. The most negative country in the world was Central African Republic, where 76% of residents experienced physical pain and nearly as many (74%) reported worrying a lot the previous day. The Most Generous Countries in the World: While 2017 may have been the worst year for the world emotionally, Gallup's latest survey on charitable giving around the world showed that billions worldwide are donating money to charity, volunteering their time or helping strangers in need. And they didn't need to be rich to do it. Acceptance Higher Among People Who Know Migrants: Knowing a migrant might go a long way to help ease migrants' integration in their adopted countries. In 134 out of 139 countries, people scored higher on Gallup's Migrant Acceptance Index if they personally knew at least one migrant. This is true in the U.S. and Canada, two of the most accepting countries in the world. More Than 750 Million Worldwide Would Migrate If They Could: People's desire to migrate permanently to another country actually increased between 2015 and 2017. This increase might be good news for countries like Japan that are looking to increase migration, but Gallup's Potential Net Migration Index suggests Japan has a long way to go to make it attractive to migrants. Peace, Security Still Out of Reach for Many Worldwide: Venezuela and Afghanistan were the least secure out of the 142 countries Gallup surveyed as part of its annual gauge of how safe people feel. Seventeen percent of Venezuelans and 20% of Afghans in 2017 felt safe walking alone at night where they live. Violence Shakes Afghans' Security Ahead of Elections: Security deteriorated in Afghanistan in the lead-up to the country's parliamentary elections in 2018; just 13% said they felt safe walking alone at night in their area -- the lowest percentage in the past decade. Their misery was also apparent in their record-low ratings of their lives. Latin Americans Vote in Climate of Discontent: 2018 was an important political year in Latin America, as residents in four of the region's most populous countries -- Brazil, Colombia, Mexico and Venezuela -- voted for president. Mexico's largest voting bloc -- young people -- was highly disillusioned. And Brazilians faced a confidence crisis. A Tale of Two Frances Before Riots: Emmanuel Macron is the president of two Frances: one that is wealthy, thriving and approves of his leadership, and one that is poorer, isn't thriving and is calling for his resignation. Both are in flames.